Looking for a PeopleSoft job? We’re here to help. We’ve compiled a huge database of PeopleSoft interview questions, which will help you sail through any interview for PeopleSoft jobs. The questions in this and other posts on “PeopleSoft Interview Questions” are good to know irrespective of whether you’re looking for a PeopleSoft developer jobs, PeopleSoft administrator jobs or PeopleSoft functional jobs. 1) Draw a simple diagram of PeopleSoft three tire architecture? 2) What are the three main component of PIA Architecture? 3) How does client communicate with the WebServer? 4) Name the application used for communication with PeopleSoft application? 5) What protocol is used between client and WebServer? 6) How does the WebServer communicate with Application Server? 7) How does Application Server communicate with Database Server? a. Using SQL.NET Oracle client has to be enabled on Application Server , it communicate to Database server using TCP/IP (or) IPCX on 1521 (default) normally listener should be running on Database server. 8) What is the function of an Application Server? b. All applications are available here. e. It stores the Business Logic. f. Prepare the SQL statements and send to Database. g. Combination of several process. 9) What is WebServer ? a. WebServer provides the internal architecture functionality in PeopleSoft. b. It receives the HTML page from Application Server and sends it to respective client. c. It is a combination of difference servlets which fulfills the client requests like page servlets etc. b. Tuxedo Application Server is a collection of server process that communicate to Database server. c. On the server side WSL are listning to client. JSL are listening to JAVA CLIENT. d. These server process request individual service can handle jobs such Application Server. b. JOLT performs identical functions but handles connection to java applets/servlets exclusively. c. JOLT provides the communication between WebServer and Application Server. 12) Write down various process of an Application Server ? 14) What is TWO-TIER CLIENT? a. 2-tier connects directly to the database. d. This system requires windows, PeopleSoft client software and Database client software to mange the communication with the RDBMS. 18) What peoplesoft components reside on the webserver? 19) List down the tables names involved in the People Soft Authentication Process? 20) Name the table where PeopleSoft user ID and passwords are stored? 22) What is Verity and how it is used? Verity is a search index and it enables full-text searching of PeopleBooks. Verity also powers other search functions in PeopleSoft like Applicant index, Job index etc. 23) What is PeopleSoft Vanilla Database? 24) What is a Customization? Changes done to PeopleSoft application install as per the Client request and not provided by PeopleSoft. 25) How do we start and stop Apps Server? · Normal – listener stop accepting new request. Any jobs that have been accepted or finished and the BBL shutdown all of the process. · Forced – listener stop accepting new request. Any jobs that have been accepted are aborted, and the BBL shutdown all of the process. Press 1 or 2 as you required. 26) How do we start & stop Webserver in single server domain? 27) Which are the external objects in a PeopleSoft environment? 28) What is PeopleSoft Fileserver? · The File Server is used as a central storage area for files used by development clients. · This allows for a central point of file revision administration. as well as saving significant disk space on each client. 29) What is Report Repository? · The Report Repository is simply a Web Server with the report repository servlet and directory installed to it. · Report Repository Directory: Location on the Web server where the process scheduler server transfers report and log files. · Report Repository Servlet: The Java sevlet program that manages the display of the report and log files in a browser. If a user has been granted security access, the servlet allow them to view the files. If the user doesn’t have the permission, the servlet will not even show the file exits. · The Report Repository will always receive any report produced by processes on the server if you establish this link. · If you also check the Transfer Log files to Report Repository option, all log and Trace files associated with any process, report or otherwise, will be placed in the Report Repository. Ans: SYSAUDIT delivers a report on the integrity of the links within the PeopleTools Tables. Ans: DDDAUDIT delivers a report on the integrity of the links between the System Catalog Table and PeopleTools Table. 32) What is the ALTER AUDIT? 33) Name the configuration file of Application Server and its location? 34) Name the configuration file of Process Sheduler and it’s location? 35) Name the configuration file of Webserver? 36) How do you change the port of Jolt of an Apps Server? 37) What modification is required at Webserver side when a Jolt port is changed? 38) What is ACCESS ID? · It is used to determine RDBMS level access rights. · The Id and password are stored in the RDBMS security tables. · Typically system administrator ID. · one user account. (sa or sysadm) is used as the ACCESS ID for all users. 39) How do we delete the cache of the Apps server? · Shutdown the Application Server first. You can also use Purge Cache option to delete the cache. 40) How do we delete the cache of the Process Scheduler? Shutdown the Process Scheduler Server first. 41) How do we delete the cache of the WebServer? Shutdown the Web Server First. 42) How do we generate trace file for Application Login? 43) How can we migrate PeopleSoft project from one environment to another? 44) Write down object migration path. Say, we want to apply a patch. Name all the environments which it should pass thru till it reaches Production. (Show diagram is necessary). First we apply the path in DEMO then in TEST and in last we do apply the patch in PRODUCTION instance. 45) What all can a PeopleSoft Patch contain. A People Soft Patch consist of People Soft project, SQR, DMS, Cobol programs & SQL statements. Compare reports defines the difference between the source and target Database and produce a report that identify the differences definitions with difference between the two Database. Customer changed the object after installing the last release. The definitions has been compared, its LASTUPDOPRID value is “TPLSOFT”, and its LASTUPDDTTM value is greater than the date/ time stamp of the comparison release database, in other words the people soft modified the definition since the comparison released. The definition has compared, its LASTUPDOPRID value is “PPLSOFT” and its LASTUPDDTTM value is less than or equal to date/time stamp of the comparison release database, in other words the PeopleSoft Last modified the definition prior to the comparison release. 47) From where can be monitor the status of a Process Scheduler in PIA (write the navigation path)? 48) Briefly write what the Process Scheduler is used for? 49) What is a database refresh? 50) What is database clone? Database cloning is similar to database refresh. Only difference is the purpose. While database refresh may be a periodic activity , database cloning is usually done to create new databases. 51) Can one file server talk to 2 different databases? 52) Can two different apps server talk to 1 database? Ans: As the load increases, the BBL (Bulletin Board Liason) keeps track of how many request are in queue for each process. If a process is overloaded, the BBL launches another instance of the process to handle the increased demand. 54) How can we migrate a customized object between 2 databases having no physical connectivity? On source environment – Insert PeopleTools object in a project in application designer. Use ‘Copy project to file’ feature. Copy the exported file to target system. 55) How can we migrate Message catalog between 2 databases? 56) What is the usage of Data Mover Tool? Ans: Data Mover Tool used to move PeopleSoft application data into RDBMS database instances. 57) What is Integration Broker? Settings for how information will be passed through the integration Broker environment. 58) What is SYMBOLIC ID? · It is an alias that ties the user ID to the access id. · Since the access id is so powerful, it is not stored in the PSOPRDEFN table where casual users might see it. 59) What is CONNECT ID? · Mainly used to establish connect to RDBMS. · ID and password are stored in the RDBMS security tables. · Access rights are limited to what is required to verify the validity of the USER ID requesting connection. 60) What is USER ID/OPERATOR ID? · The users stored in PeopleSoft security tables PSOPRDEFN. · The users access rights within the application or tied to the USER ID. 61) What is THREE-TIER CLIENT? 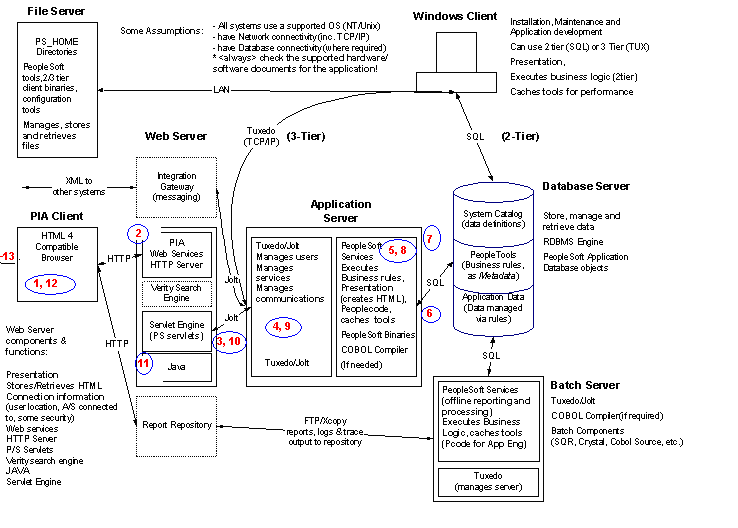 · THREE-TIER CLIENT uses TUXEDO and Application Server to mange the connection to database. · This doesn’t require Database client software. · This system requires windows and the PeopleSoft client software. 66) Explain the PeopleSoft architecture at a high level.what are the communication software applications, protocols? 67) Walk through the process of how a request from the client gets processed and returned to the client from a data perspective? 69) Assuming that the database is installed and properly configured, how do you configure the remaining components to connect 2-tier, 3-tier, 4-tier(via web)? Builds and saves html pages, runs People Code, processes messages, and handles most client SQL requests. PSAPPSRV also performs user authorization duties when clients initially log in. Process conversational SQL transactions, primarily for the Application Designer development tool. Specialized process that handles all SQL generated from the People Soft Query tool. When this server does not need to be started for the domain to run, not having PSQRYSRV configured can lead to poor performance. Specialized process that handles all shorter, read-only client SQL requests. This server is not currently used by the PIA client, and does not need to be started for the domain to run. These are the servers that manage Integration Broker queues, the dispatcher (DSP) picking up requests passing them to the handler (HND) which determines the type redirects the request to the proper queue for further processing. The Publication Dispatcher (DSP) and Handler (HND) are responsible for publications-outbound messages from the Integration Broker environment – formatting the information and routing it to proper external systems. The Subscription Dispatcher (DSP) and Handler (HND) are responsible for processing subscriptions- in bound messages from external systems-bound to this system. Supports People Soft PEOPLECODE debugging sessions. 71) What are WSL & JSL and what are they used for? Ans WSL-Wrok Station Listener is used to communicate with Application Server from fileserver connect through 3 tier arch. And JSL – Jolt Station listener is used to connect client from webserver to Application Server through 3 and 4 tire arch. 72) Where is the user session timeout set and how do you set it? 73) How is failover of the application server set with the delivered Peoplesoft software? 74) Where and how is the report location set? Report transfer method set? 75) How do you install a new service pack for Web Logic? 76) How do you install multiple PeopleBooks to the same server? 77) What are the components of the PeopleSoft process Scheduler Architecture? 78) Two web servers are used in the production environment for load balancing/failover. How would you configure both web servers to share a single Report Repository? 79) How would you set up the environment to allow running a report to a printer? 80) What are the various ways to optimize performance for any and all components of the PeopleSoft application? 81) You have multiple Process Schedulers running against a single database. How do you configure the environment such that a user can submit a process without having to identify a specific Process Scheduler process to complete the process request? 82) What are the PeopleSoft reports that need to be executed before and after a patch is applied? Why? What do they do? How do you resolve issues that appear on these reports? 83) Walk through the process of applying a patch/fix which involves all types of object (internal: add, delete, update; external: SQRs, COBOLs, DMS Scripts, etc)? 84) Walk through process of migration objects from one environment to another with considerations for recoverability of environments should the migration fail? 85) How do you keep customizations during a migration? 86) How do you check the status of the Application Server Process? Process Scheduler Processes? 87) What are the different ways to trace a PeopleSoft AE program? SQR? COBOL? 88) What is TraceSQL? TracePC? TracePPR? TraceAE? Where is this set? How do you set the values? · Component(s) on a page? 90) How do you reset the Access ID/Password? 91) On occasion, the Report Manager status for a report will be inconsistent with the Process Monitor status resulting with the inability for the user to view the report. How can this be resolved? 92) If you can to manual purge reports from the system, which database tables do you need to clean up? 93) You want to move all the data from table X in environment 1 to environment 2 and replace all existing data in environment 2. How would you do this? 94) You have just recovered a database after the system experienced a failure. You try and boot the Application Server but it fails? What do you do? 95) How can we connect to PeopleSoft database in 2-tier mode? What is the purpose of application designer? 96) You want to change some parameters of Application Server? How will you do it? 97) You change the PeopleSoft owner schema password will there any effect? If yes now will you resolve it? 98) What are the steps to migrate changes from a development to a test an environment (compare, check Audit flags, migration, validate)? 99) How will you enable PeopleCode debugging? Define steps? 100) Briefly describe a process of building a project?